Warning: If you haven’t gotten a character to Level 100 in Warlords of Draenor, stop reading. The Light, and truth, equally burns. Mataoka’s brother mused, “Ah, women – they never get along,” but she had known plenty of men who engaged in turf wars. This was not a case of simple female pride—something was very off about Yrel. Jealousies tamped down her instincts, however, dismissing simple signs and easy actions. She should have seen all coming, but her vision turned greasy and foul. She kept any further complaints about the new paladin “savior” to herself after his dismissal. Jealousy—there is the strangest of emotions. It serves no purpose, and causes only damage. It is not the hate that burns villages, nor the love that creates life: jealousy eats and is never satisfied, destroys and leaves facades, loves fiercely but cannot create more. In the distant past, an ancestry, Yrel’s branch grew on the family tree, a broken line, perhaps a cousin. Mataoka’s mother told tales of a great heroine who fought side by side with the bravest of leaders of Draenor: Velen, Nobundo, and Maraad. Mataoka imagined herself fighting by Maraad’s side, saving the Draenei, changing the course of loss and blood. She had personally met the Prophet many times, and felt his blessing upon her brow, though her heart and shamanistic rituals stood loyal to Nobundo most of all. Mataoka tolerated the Light because it was her people’s way, just as they tolerated her bonds with the elements. To have a chance to save Draenor, to show herself worthy, to honor her mentor Nobundo—the redemption and glory! And just as in her dreams, here she was as an equal to Maraad, helping him find his way anew. And when it began, Mataoka was ready. The smell of burnt oil and sick permeated the air. The ground flowed with fel vomit, waste products, toxic and slow burning. She attacked with Khadgar, Maraad, and Thrall before dawn, her spirit wolves at her side, more ferocious than ever, as if some ancient prey taunted them – they sought revenge like one and all – the time’s heat melted all boundaries between past and present, and in the razor’s edge of now, reclamation was theirs for the taking. Everyone sought a second chance, it seemed. And there in rags, in a cave, standing suspiciously over a dead orc warlock, whimpered Yrel. Her horns were unlike any set Mataoka had ever seen—thick, large, curved around her ears and chin. 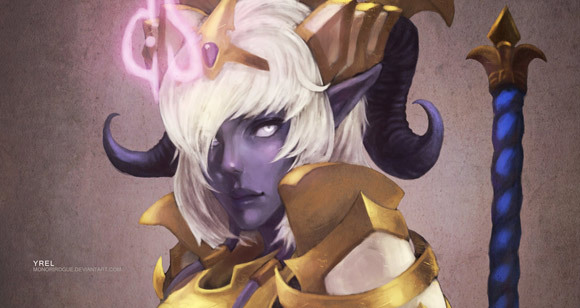 Through the generations why had no other Draenei received these horns? The singularity, the otherness made her suspicious. Mataoka defiled her true nature, before the past became the now, by changing her skin from lavender to blue to please her mother, to be more of a proper “Draenei.” To show the Prophet her birthright and allegiance. And here was Yrel with skin the color of an Azuremystian field, just as Mataoka once had. Yrel’s manner seemed coy: “Oh, someone else is here!” Mataoka wondered why she was hovering over the dead orc…was she waiting a rescue? And then to say she was fine on her own, and sent Mataoka on her next mission. She didn’t even recognize a fellow Draenei! Yrel took charge immediately: ordered Mataoka to go with her to find her sister Samaara– including no recognition by any of the Draenei. Yrel kept off-handedly referring to her as “hero,” or “champion.” Yrel’s lack of acknowledgment gnawed on Mataoka. And the bones snapped, and splintered. And stuck. Trapped in this new time, Mataoka couldn’t easily go back to Stormwind, or Azuremyst, though the songs in the trees and on the wind sounded just like home, it played false. She wondered if others heard the songs too, or did only she hear the songs of the past, clear as cathedral bells? And the drumbeat of more orcs. Mataoka’s blades dulled, and her eyes faded. Her heart heavy with envy, and she grew fatigued. But though the world seemed a dream, and its inhabitants all ghosts, they would kill her if she let down her guard. The monsters proved satisfyingly easy to slaughter, but the real monster grew inside. Every third step, she would see Yrel again: her armor improved, her status growing. She stood next to Maraad and the Prophet as a peer, taller than the others, again, in a swamp acting shy around the Prophet, “Oh, I am not ready to lead soldiers!” and the next moment ordering battle-hardened warriors as if she was born to it. Yrel never called her by name, though Khadgar did, and sometimes even the Prophet. To Yrel, she was just another ‘hero,’ said with the commonality of Mataoka’s origins: low and common. Or at least that’s how Mataoka heard her. “Many depend on you,” the Prophet said. Yrel’s accent was Draenei, but off somewhat. Mataoka couldn’t place it. It had a particular pitch that seemed sweet, but the stinger was still in the honey. “No, I don’t agree,” thought Mataoka. Yrel gossiped about Maraad, too; subtle things, little criticisms, and Mataoka knew no purpose for this ingratiating babble. She was not impressed, it did nothing to placate the hate, nor did it make her feel closer to Yrel. Who the Sargerei did this woman think she was? And those Sargerei; oh how Mataoka envied them most of all, and felt the most shame for this. The magic and power the netherbinders wielded, consuming all with no mercy. Gul’dan’s black grip held all the power. They were Draenei with the powers of warlocks, the powers of Gul’dan, who surely was their destruction in this world, as he had been in all worlds. Power never lets go, and if the world has shown anything, those with the most get more. And those without simply die faster. Ner’zhul took Yrel’s sister, and on an alter of blood and bone, stole her life, her soul, and brought Yrel to her knees. If one of her sisters was on the slab, she knows she could have saved them, of this Mataoka was sure. Prophet, her sisters would never have gotten in that place to begin with! Her sister the priest, or the paladin! Ha! Mataoka would have like to seen Ner’zhul try to tie Luperci to a slab! But her sisters followed the Light. No one ever spoke of rock and water, or fire and air. Being a shaman she was already behind the shadows, in the dusk of energy. But the hate sank deep in the final moments, during the Prophet’s final apotheosis, he chose Yrel over her. Chose Yrel without hesitation. He placed the blessing of Light on her forehead, and her screams of protest scratched Mataoka’s scarred heart with their pitchy, fake notes. She couldn’t respect Yrel, and she hated her, and she must know follow her. This was the only impossible thing she had ever been asked to do. Nobundo – she would pray to Nobundo! Her father, her mentor, her guide—the one who owned all true wisdom and solace. Nobundo would guide her. In this new land, she sought the elementals. 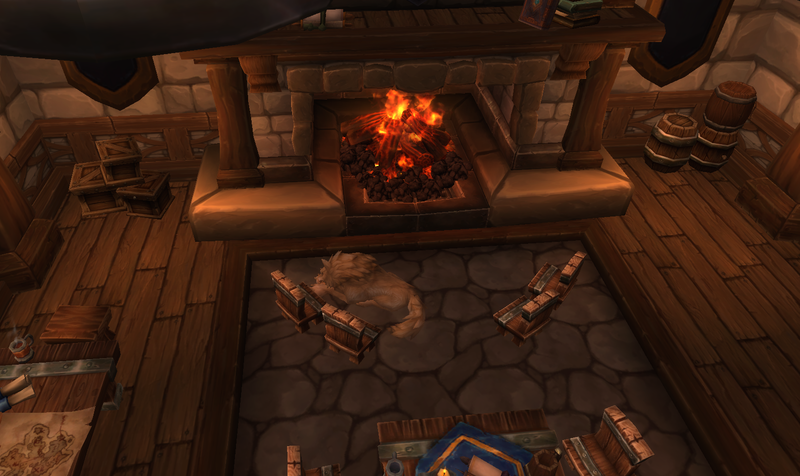 Like her Dwarf friends in an ale house, there they were, right where they should be in Nagrand. Some things are dependable as the sun. She fought for the elementals, single-focused, determined, and felt powerful again. When Yrel couldn’t save Maraad, but seemed resigned to his fate, Mataoka hate increased. She carried with her the mark of sin from her hatred of Yrel, but she didn’t reflect, she didn’t consider, and she tried to move forward. The mark manifested itself as a dull blessing of Light on her forehead, dimmed and sick. As soon as she was finished settling the elementals, she would find a way back to the Exodar and speak with Nobundo. In the center of the elemental circle, a young, handsome paladin Draenei stood. There stood Nobundo, from the past. Why hadn’t she considered this? All were ghosts, all were here…all were gone. He answered he felt he was in a dream, and seem befuddled and a little scared. There was no one now. She wanted more than anything to go home, but there was no home. The moment. The moment, inauspicious and embarrassing: Mataoka realized Yrel could no more change her destiny than any mortal. Yrel didn’t see Mataoka because Mataoka was nothing to her, a shadow: the ghost was not Mataoka; the ghost was Yrel. She spoke to one and all like talking in a dream: it held no weight. Like looking at modern day Auchindoun, with the souls wandering, she was witnessing the future souls past. Then Mataoka felt nothing but pity. Yrel was beautiful, brave, and a holy warrior: Velen chose her, yes, but without the flesh and blood, the pumping hearts, and the unctuous, nasty part of living, there would be no redemption for any soul, living or dead. The Prophet knew this. Yrel, once and future savior would know no other path. Mataoka went wolf form and lumbered quietly to the room of the garrison with the floor pillows, off to the side, away from the followers, workers, knights and lieutenants. No one was there. The pillows were made of the finest flaxseed linen, filled with downy feathers, washed in the clearest part of the warm oceans, smelling of salt, air, and water. Mataoka slept well and deep for the first night in weeks, and dreamed of running in the fields of Azuremyst. This is actual questing text during Shadow Awakens. I know Talador is a beautiful zone but for some reason neither Cim or Cat liked it much and kind of left it unfinished so I probably missed a huge chunk of Yrel. I’ll have to go back later. Cim was focused on iLevel 615 and Cat’s not focused on anything, lol. Cim did make it though so hopefully the OLRG will ride! But did you like the story?! 😃 you’ll get there have no fear! Oh crap, figures I’d forget to say that. Yes, I loved the story but then I like them all the hard part is picking favorites. Oh whew – thanks! LOL I am such a dork. Wow, I can’t believe you finished it up so quickly! You added, like, a third more to it! And you cleaned it up really well. I love it, of course. Your thoughts mean the world to me. Thank you so much. I have been writing this in my head since Mataoka first encountered Yrel, and the overwhelming feelings of jealousy were too palatable not to write about. And –they mirror my own life, of professional jealousies and resolution. Tough stuff. I’ve been trying to adequately word this comment in my head since I got to read this. It’s beautiful. And real. I loved it. Was super excited when I saw it come up in my sidebar and realized it was the story you’d mentioned and I wasn’t at all disappointed when I got to read it. 😀 Thanks so much for writing and sharing it. That means the world to me: thank you.